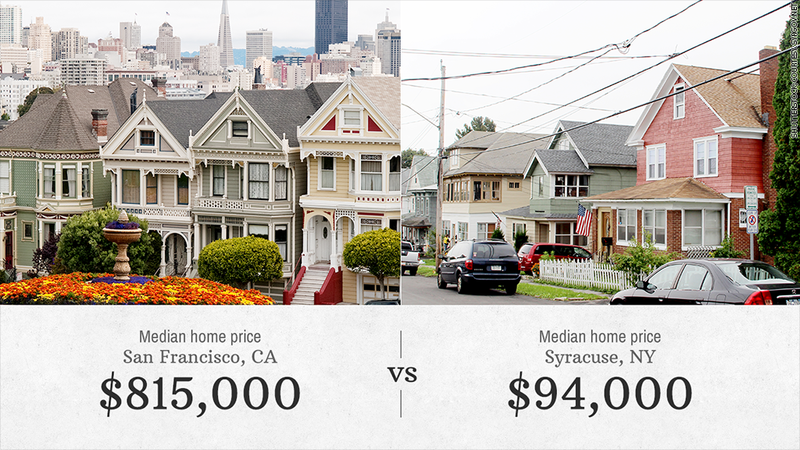 Few can afford a home in San Francisco, while nearly all of Syracuse's residents can afford to buy a place. When it comes to buying a home, America's affordability gap is growing ever wider. For the typical American household earning the median income, 65.5% of homes were affordable during the first quarter, according to a survey by the National Association of Home Builders (NAHB) and Wells Fargo Bank's Housing Affordability Index. But in cities like San Francisco, Los Angeles, New York, Boston and Denver, where prices are soaring, it's much more difficult for the average earner to afford a home. "High-cost cities are rebounding faster than low-cost ones," said David Crowe, chief economist for the NAHB. "Unusually large increases in wealth have driven up prices." In San Francisco -- the most expensive metro market in the nation with a median home price of $815,000 -- only 13.3% of homes could be purchased comfortably by households earning the median income of $100,000. That was down from 28.9% in 2013. Expensive cities tend to keep growing more expensive because they're already so densely packed with housing. "A way to keep prices down is to add to the supply by building new homes," said Crowe. But that's harder to do in places where there's not much land to build on due to coastlines or mountains. Related: How far will my salary go in another city? Source: National Association of Home Builders and Wells Fargo Bank. The Housing Opportunity Index is based on median home prices, median household income and interest rates during the first quarter of 2014. The percentage of affordable homes sold during the quarter were those that could be afforded by households earning the median income. Meanwhile, the most affordable U.S. cities tend to be in the Midwest and Northeast, predominantly in old industrial towns where the economy is no longer expanding and there is plenty of land to build on. In Syracuse, N.Y. , for example, nearly 94% of homes could be comfortably paid for by a family earning the median income, according to NAHB's index. That's up from 91.6% a year before. Helping Syracuse's residents better afford homes is its high median income of $67,700, which is about $4,000 higher than the national median. That goes a long way toward affording a home in the area, where the median price of a home is just $94,000. Nationwide, affordability has improved. Even though median incomes shrunk to $63,900 from $64,400 in 2013, median home prices have also fallen, to $195,000 from $205,000 in the fourth quarter. Meanwhile, mortgages are slightly more expensive but still relatively cheap. Interest rates averaged 4.36% on a 30-year loan in the first quarter, compared with 3.5% a year earlier. "Housing affordability remains strong and this is an encouraging sign as the spring home buying season moves into high gear," said NAHB chairman Kevin Kelly.